What Is the Future of the Asian American Church? Do you know what the largest Christian nation in the next ten years will be? According to Ray Chang and D.J. Chuang , leaders of the workshop entitled “The Future of the Asian American Church” at the Exponential West conference in October 2014, it has been predicted that it will be China, not the U.S. They said that the gospel has been moving progressively westward from Africa, to South America, and now Asia. And in China, the growth in the Christian population is unprece-dented, unlike anywhere else in world at this time or any other time since the First Century when it was as high as 42% per year. If that is true, what does that mean for the Christian world and for the Asian American Christian community? This is one of the interesting questions raised by the workshop. 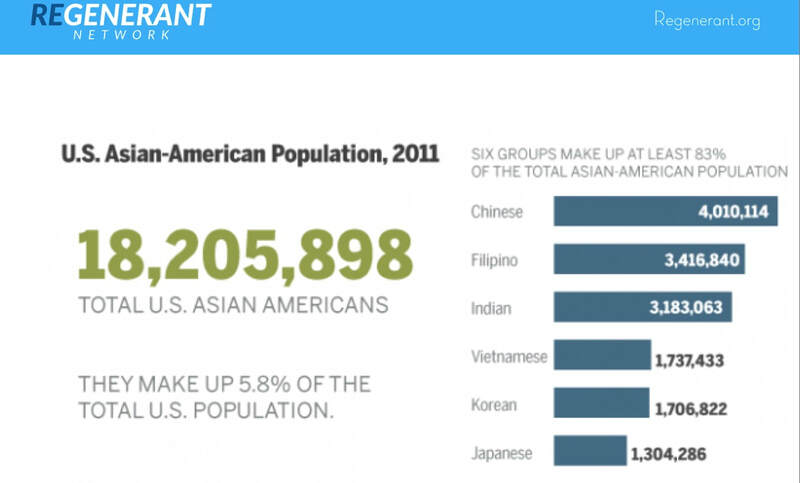 In the U.S., Asians are the fastest growing racial group surpassing Hispanics more than five years ago. According to the U.S. Census Bureau, in 2011, Asian Americans numbered 18.2 million, making up 5.8% of the total U.S. population. And six groups made up at least 83% of the Asian American population—Chinese (4.0 million), Filipino (3.4), Asian Indian (3.2), Vietnamese (1.7), Korean (1.7), and Japanese (1.3). This growth has caused a change in the landscape of ethnic diversity in the U.S. A look at the most commonly spoken language other than English or Spanish in certain states verifies this change. In California, it’s Tagalog. In New York, Chinese. In Texas, Vietnamese. In Georgia, Korean. And in Minnesota, Hmong. It has been estimated that the 18.2 million Asian Americans will to be about 40.5 million by 2050—more than double. Chuang said that there are an estimated 7,123 ethnic Asian churches in the U.S., 4,000 of which were Korean; 1,200—Chinese; 800—Asian Indian; 300—Vietnamese; and 250— Japanese. Many more will be needed if this growing population is to be reached. Thus, Chang and Chuang believe that Asian American churches need to be planted to meet this challenge. 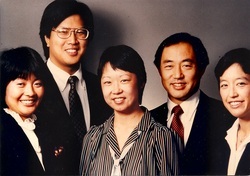 They themselves planted an Asian American church and have established an organization called Regenerant Network to encourage the planting of more. We at Iwa also believe that more churches need to be planted to meet the challenge of reaching the growing population of Asians in the U.S. However, the population of people of Japanese ancestry presents a special challenge. The church-planting strategy may not work as well for the Japanese as it would for other Asian groups. I found the “rethinking” to be more a “validating” of Iwa’s long-time thinking. It seemed that mainstream thinking about evangelism was now coming more in line with the thinking that Iwa has been talking about for over 30 years. Words and ideas like “relational evangelism,” “relational discipleship,” “evangelism as a process,” “incarnational evangelism”—“being Jesus to others,” “life-on-life discipleship,” and “sharing your story” were bandied about in the course of the conference—words and ideas that have been part of Iwa’s vocabulary and culture for decades. This current emphasis on personal relationships seems to be a reaction to the strategy of doing outreach to the masses through seeker-friendly programs. Iwa has always been about relational evangelism because it makes cultural sense to do outreach relationally to people of Japanese and Asian ancestry who are culturally relational people, and because it was the way Jesus did evangelism. and ethnically blended with other Asians and non-Asians, and less self-identified and identifiable as Japanese, as the population moves into the fifth and sixth generations ahead of other Asian groups—so targeting them becomes a tremendous challenge. And they are traditionally more resistant to the gospel—less than 1% Christian in Japan, and less than 10% in the U.S. according to Chang and Chuang—so the time and effort it takes to reach them, let alone build a church, may be exponentially greater than for other Asian groups. Along with church planting, other strategies should be considered. Perhaps these new Asian American church plants, as well as established Asian American and even non-Asian American churches, might create a special ministry dedicated to reaching and discipling Japanese and/or Japanese Americans. Certain cultural and social factors make it unlikely that they will be reached through a general outreach effort focused on Asian Americans. They will very likely slip through the large, wide “net” but will more likely be gathered in by a smaller, more tightly woven net specifically designed for them. Perhaps the strategy that has the best chance of success is one that Iwa has been advocating throughout its ministry. And that strategy is one that was mentioned often at the Exponential West Conference—a strategy that focuses on reaching people relationally. But the relational focus would not be on strangers or people with whom there has been little to no prior contact, but on people who are in the natural relational networks that God has already established—networks of family, friends, and acquaintances. If Japanese and Japanese American Christian individuals, families, and groups, as well as others who want to reach people of Japanese ancestry, could be trained to reach their natural relational networks effectively, and could put their training into action, they will have more impact on reaching the unreached 99% or 90% populations of Japanese or Japanese Americans than any Asian American church plant. May God raise up people who have hearts to reach the unreached people of Japanese and Asian ancestry and who are equipped to effectively reach them. Ryan Kwon, Lead Pastor of Resonate, a Gospel centered church/missional movement in Fremont, CA, spoke on video at both the Exponential West and East conferences about how God called him to church planting at an Exponential East conference in Florida. Other Asian American speakers at the plenary sessions for the West conference were Dave Gibbons, founding pastor of Newsong Church and CVO of Xealots, and Francis Chan, founding pastor of Cornerstone Community Church in Simi Valley and author of Crazy Love and Forgotten God. So for me, the “rethinking of old paradigms” really didn’t present a “new” challenge. And it did give me cause for concern that Iwa’s relational emphasis will be perceived as nothing new, just the same as what everyone else is already thinking and doing. But it also gave me hope that mainstream churches will become more effective in their outreach and ministry to people of Japanese and Asian ancestry as they do evangelism and discipleship more relationally. Iwa President and Founder Stan Inouye spent a great deal of his time over the past year-and-a-half investigating something he had heard about, was fascinated by, but had only gotten bits and pieces of information about--the relationship between Christianity and the Japanese tea ceremony. As he delved into his investigation, to his amazement, Stan found far more than he could have possibly imagined when he started. It was a kairos moment when three major streams of influence in Japan converged﻿﻿﻿--﻿﻿﻿Christianity (religious), the tea ceremony (cultural), and military conquest to unite feudal Japan (political)—and put Japan on the road to becoming the nation it is today. "This study reveals the reasons so many Japanese became Christian during the Christian Century, and why, after two centuries of isolation, they became so resistant to Christianity. Hopefully, effective application of this study's implications will lead to effective ways of reaching people of Japanese ancestry for Christ in Japan and elsewhere in the world﻿. Some applications may include educating Japanese about Christianity's influence in Japan's history, hospitality based on tea ceremony principles, and reformation of the tea ceremony for Christian worship and evangelism in today's context." Any feedb﻿﻿ack on the study is welcomed. Please fill out the form at the bottom of this page. More detailed summaries are available to read upon request. Dr. Greg Waybright, Senior Pastor of Lake Avenue Church, one of the largest churches in Pasadena, and past President of Trinity International University, was trying to figure out what he might give to his host in Asia who had invited him to encourage pastors in several different cities over an intense ten-day period. When he saw the God Man poem on display as part of an exhibit of Yoshi Ishida’s artwork at Fuller Seminary’s bookstore, he immediately knew that was what he wanted to give. He tried to purchase a copy of the poem at the bookstore, but it was not for sale. So he contacted Iwa directly about obtaining a copy. After informing him of the problems in publishing the poem, Stan gave him two different proofs: a small hardback copy for himself and a large 12” x 12” art book version for his Asian host. After Dr. Waybright returned from Asia, he invited Stan and Janie to lunch in his office. He shared how God is moving in unprecedented ways in Asia, and how his host appreciated the God Man poem so much that he mentioned how much he enjoyed it a number of times. Dr. Waybright also offered to do several things on Iwa’s behalf. God Man Bible study series on Iwa's website and give him her impression of its potential for their church. Please pray that we at Iwa will keep in step with what God is doing and follow God's lead. Beginning with evidence of God’s early attempts to touch the lives of the people of Japan, Stan talked about how the idea that the Lost Tribes of Israel traveled along the Silk Road and ended in Japan may be supported by evidence of Hebrew influence on Japanese culture and language as well as on Japan’s native religion, Shintoism. He then shared how Hada Christians came to Japan as early as the second century A.D., and how Nestorian Christians migrated to Japan and influenced Japanese Buddhism between the sixth and ninth centuries A.D. These instances of God’s presence in Japan set the stage for what is known as “The Christian Century” from 1549 A.D. to 1639 A.D. which began with the arrival of Francis Xavier, a Portuguese missionary of the Jesuit order, who introduced Catholic Christianity to Japan. Stan indicated that when the Jesuits came to Sakai, they gave the evolving tea ceremony its first significant contact with Christianity. Sakai was a region where merchants, who formed the lowest class in Japan’s feudal society, were transforming elaborate, exclusive“Buddhist tea” for upper class society, into simple, accessible “merchant tea” for common people. And Sen no Rikyu, who is credited with starting the development of the tea ceremony into the form that is practiced today, was from Sakai. Through his wife, who was an early Christian, Rikyu was introduced to the sacrament of Holy Communion. Although he never professed to be a Christian, he well could have been one as he surrounded himself with Christians, and he seems to have incorporated elements of Communion into merchant tea. supreme military rulers who unified Japan. Together with his disciples of the tea ceremony known as the Seven Sages—most, if not all, of whom were Christians, and all who were top national military leaders in their own right—Rikyu took merchant tea to a new level by making it “diplomatic tea.” It was used to facilitate efforts to bring about peace and reconciliation between warring military leaders and to create new alliances. In this way, three waves of change flowed together to transform Japan-- religious (Christianity), cultural (the tea ceremony), and political (the unification of Japan). And God once again reached out to touch the lives of the people of Japan. Due to time constraints, Stan was able to get through just half of his outline. But he asked the audience how many people would be interested in hearing “Part Two,” and a great majority raised their hands. In his conversations with participants following the presentation, Stan got a sense that many were very engaged and interested in what they heard and indeed wanted to hear more. So this talk was just the beginning of more to come. On a warm 4th of July evening on a stage set up on the recreation field on the grounds of the Mt. Hermon Conference Center, Paul Tokunaga, Vice President/Director of Strategic Ministries of InterVarsity Christian Fellowship (IVCF) and long-time supporter of Iwa, delivered his fourth of five messages entitled “Hope for the World Through Asian Americans: The Gift We Bring.” He launched into it with an imagined story about his bringing what he thought was a small, insignificant gift to a classy dinner party. But the gift turned out to be an enormous crowd-pleaser and the very thing the hosts were hoping for to make their special evening complete. With that, Paul asserted that Asian Americans have gifts to bring to the party that no one else can bring. Growing up in the San Jose area, Paul used to think that white people were a 10 and he, a Japanese American, could only maybe be as high as a 7. But after discovering that “God don’t make no junk,” he has come to believe that God loves him as much as the white leader and the black musician, and he and other Asian Americans are a vital, unique part of the Body of Christ. Contending that Asian Americans have unique gifts to bring to “the party,” Paul identified four: the capacity for developing deep friendships and being “community glue;” wealth (higher personal and household income than the average in the U.S.); intellect and education; and Level 5 leadership. In expanding on the gift of “community glue” that group-oriented, harmony-seeking Asian Americans bring, he gave credit to his “pal” Stan Inouye for teaching him a word that might be considered a defining characteristic of Japanese culture--omoiyari, which roughly translated means “empathy.” One aspect of omoiyari is the ability to anticipate another person’s needs and desires and to meet them without the other person needing to ask. Paul noted that it has been an amazing experience at this conference that, for example, all he had to do was think “coffee” and two cups of coffee would magically appear, one from each side of him. He felt “omoiyari-ed to death” during the entire conference. His idea that Asian Americans have what it takes to be Level 5 leaders inspired him to create an Asian American leadership development project for IVCF called the Daniel Project. The 18-month project resulted in 12 of the 14 Asian Americans who went through it being placed in significant leadership positions. As a result, IVCF staff began to see the beauty of the way that Asian Americans lead—using their value for hospitality and community to build teams that others wanted to be a part of, and handling conflict sensitively and discreetly. The project was so successful, they ran two more, and they started ones for blacks and Latinos, as well as other parts of IVCF that wanted it as well. After the evening session ended, Cyril had the great privilege of greeting and chatting with Paul’s stepmother. Residing in nearby Campbell, she, along with other family members, had come to hear Paul speak. She remarked that she was so glad she came and was delighted that she lived so close to such a wonderful camp that she never knew existed. After letting her know how much he and others appreciated and valued Paul’s leadership and ministry, Cyril congratulated her on her 90th birthday that he knew her family would be celebrating with her on Sunday, and mentioned that his own mother was 92. Establishing a friendly connection, he was able to engage in a warm, pleasant conversation. At the beginning of his final message the next day, Paul thanked the audience for making his family members feel well-received as they all came away having had a very positive experience. Seven family members came, and for about half of them, this was the first Christian gathering they had attended, and the first time they heard him speak. 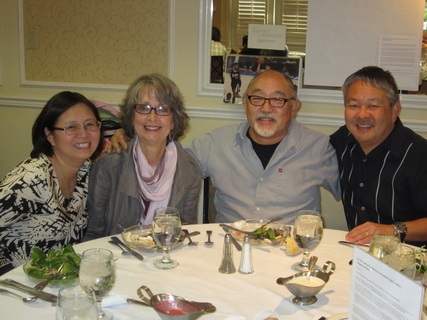 It seems that the group-oriented, harmony-seeking, omoiyari-endowed Asian American Christians put into action their unique gift of “community glue” and warmly embraced Paul’s family with a special Christian welcome that had significant impact. It’s what Iwa likes to emphasize as the way to reaching effectively people of Japanese and Asian ancestry for Christ— through the ministry of hospitality. And Paul’s family got a good taste of it on the 4th of July. When he “sang,” “Tonight’s gonna be a good night,” little did Paul know how true that would be. It could only be the work of an amazing and loving Lord God who not only blesses an audience by having the speaker lift up the special gift He has bestowed upon them (namely, community glue), but also blesses the speaker with that very gift He had him lift up. Praise be to God! To listen to the audio, and/or read the manuscript of Paul's message, go to L2 Foundation's website here. I just finished leading an eight-week Sunday morning Bible study at my home church—Gardena Valley Baptist (GVBC)—using Iwa’s God Man series materials, and I’m very pleased with how well it went. I gave the series a new title—“The Discovering Jesus Study Series.” It was a way to connect the series to GVBC’s mission statement: “Helping people discover Jesus and become His fully devoted followers.” So the series was very much in line with the mission of the church. In fact, starting this year, the class became part of GVBC’s regular discipleship curriculum. It had twice been offered before as part of a program sponsored by the Evangelism Committee to help seekers get to know Jesus. But the GVBC staff recognized it as a Bible study that could help new Christians, young Christians, and even long-time Christians “discover Jesus” and help them become His fully devoted followers. So I anticipate that I’ll be teaching this again on a regular cycle. Eight people took the class. And seven of them came to every session. The one who missed two classes wanted to come to them all but was forced to stay home twice due to back problems. Five were women and three were men. Five were seniors; three were young adults. Six came with their spouses; two came alone. Six were Japanese Americans, one was Japanese from Japan, one was Hispanic, and one was white American. All had one thing in common. They all wanted to get to know Jesus in a way they never had before. We started off by watching the pilot episode of the 2003 –’04 TV show, Joan of Arcadia, to get us thinking about the answer to the question, “What if God were one of us?” as the show’s theme song poses and as the show itself tries to answer. We then proceeded to explore the possibilities as we heard the re-imagined Bible stories of people who met Jesus for the first time and were changed by him forever. We heard Zacchaeus, the Samaritan Woman, the Centurion, blind Bartimaeus, the Demoniac called “Legion,” and the Rich Young Ruler tell their stories through dramatic readings by such people as Paul Robbins, a morning TV talk show host in Sacramento, whose storytelling was captured on video; two people involved in GVBC’s drama ministry who each read a story live; and the class leader who had read the stories many times before—me. The readers “became” those Bible characters and shared what it was like before they met Jesus, what happened when they personally encountered him, and how he changed their lives from that moment on. And the audience had a very positive response to them. At the end of the eight-week class, I had the sense that each person who attended, like the people in the Bible whose stories we heard, encountered Jesus in a deep, powerful, and memorable way. I was encouraged that some of them even mentioned that they were telling other people to take the class the next time it’s offered. Whether they realized it or not, they were doing something similar to what the Samaritan Woman did. So the studies did seem to take root, not just in their heads, but in their hearts as well. And the “living water” they were experiencing was flowing out from them to others. One person summed up the experience this way: “I am glad I came to this class. I felt I learned a lot, beyond what I read in the Bible. I encouraged others to take Cyril’s class. PTL!” Praise the Lord indeed! If you would like to know more about The God Man series, go here. And if you are interested in trying out the study series at your church, contact us by e-mail--iwarock@aol.com—or telephone--626-398-3468. You can order a kit of materials that will help you put it on. In the future, we hope to offer it in book form as an item that can be ordered online. In June 2012, I wrote a blog about my first trip in April to Flurries --the shaved snow bar in Cypress, CA, the profits of which go to supporting missions projects of Catalyst Christian Community. When I was there in March this year, the Manager, Don Hirata, happened to be there as well. So I thought, “Why not do a follow-up piece and find out from Don how Flurries is doing about a year later?” So that’s what I did. The first question I asked him was, “Are you where you want to be after one year?” He answered, “Yes,” and went on to explain that they’ve learned a lot about service and product over the course of a year. At the beginning, they had a lot of staff because they wanted to train a lot of people to do the work. But now, with a better handle on what they actually need, they’ve been able to streamline, cutting down on staff and hours. At the time I went there—about 2:30 on a Saturday afternoon—there were only two people working there—Don and my nephew, Philip Gohata. But a third person joined them before I left, and they needed the help. Don was very happy to report that reviews on Yelp! have generally been good. And every day new people are coming in. So the workers have to keep explaining such things as what shaved snow is, what some of the menu items are, and how to order a concoction they come up with themselves. And at the same time, loyal customers are turning in their fully stamped cards (7 stamps for 7 items bought) for a free dish, and are asking for more. That’s a good combination—new people coming, old people returning. On that day I happened to have with me my own fully stamped card. So I redeemed it for a dish I had not yet tried--Bananas Foster. When I ordered it, the woman in line behind me said, “I always get that.” It was good to know that one satisfied customer liked it. said she likes to bring her kid’s basketball team to Flurries after every game. For the record, Bananas Foster—a seasonal dish that was first introduced in the fall--did not disappoint. Here’s what it is: “Original milk snow layered with rich caramel sauce, fresh bananas, crunchy banana chips, and topped with sweet whipped cream.” I have a good feeling about it making it onto the specialty menu, permanently! I was at Flurries for about an hour. When I first got there, only a couple of tables were occupied. But there was a steady stream of people coming in and the place filled up. I’d say about two-thirds were Asian. Customers ordered all kinds of dishes—Rainbow Sherbet, Cookie Monster, Halo Halo, Rocky Road, French Toast. I even heard someone talk about what she was going to order next time—Triple Berry Pie. Yes, people keep coming back. I also heard one customer ask Don about the profits going toward charitable causes. So he was able to explain how members of Catalyst pooled their own personal resources (not the church's) to create Flurries so that with the profits they could support work to help people in need locally and around the world. So I witnessed first-hand how this innovative venture piques the curiosity and interest of customers and has the potential of being a source of God’s light to the community. I’m aware of some of the missions and outreach work that Catalyst has been doing. The wife of my nephew (not Philip) went last year with a team on a mission trip to Thailand in August, and my niece went on one to Cambodia in December. And I heard that there is a group that has been getting involved in work with homeless people through the Union Rescue Mission in Los Angeles. I don’t think that any funding has come yet from profits from Flurries to support this work, but it’s good to see how the Lord is moving people at Catalyst into missions. So with the warmer days of spring here and summer coming, and with more visibility in the community, Flurries is looking good for good business ahead. In the meantime, I think I’ll just look forward to my next trip. I need to try Salted Mocha again, but this time with coffee snow (not original milk snow). Iwa President Stan Inouye and Iwa Executive Director Cyril Nishimoto were two of the over 150 leaders who attended the 2013 Asian American Leadership Conference on March 11 - 13 at Young Nak Celebration Church in Los Angeles. And they were so glad they were there. The four plenary speakers--The Rev. Dr. James Choung, National Director of InterVarsity Asian American Ministries; Chip Ingram, Senior Pastor of Venture Christian Church in Los Gatos, CA, and President of the international multi-media teaching and discipleship ministry, Living on the Edge; The Rev. Dr. Kenneth Uyeda Fong, Senior Pastor of Evergreen Baptist Church of Los Angeles; and Nikki Toyama- Szeto, Program Director for the Urbana Student Missions Conference--all gave very insightful and challenging messages that Stan and Cyril are still processing and referencing as they take God's word to heart. The three workshop sessions allowed them to explore such topics as Asian Americans and Global Christian Leadership (David Ro, Lausanne Movement); Making the Most of Your Networks (Kevin Nguyen, Saddleback Irvine); Leadership in All Seasons of Life (Women in Leadership)(Nikki Toyama Szeto, InterVarsity—Urbana; Melanie Mar Chow, AACF; Margaret Yu, Cru's Epic Movement); and Meetings, Meals, and Mentorship: An Old Way of Training for a New Generation (Benjamin C. Shin, Talbot School of Theology). Cyril participated in Dr. Shin's workshop on mentorship and was reminded of the importance of life-on-life discipling of the younger generation—something that Iwa has talked about over the years and valued because it's the way that Jesus himself made disciples, and it fits well the culture of Asian Americans who tend to be relational people. He is seeking the Lord about being in mentoring relationships with younger Asian American Christians. While Iwa did not have a ministry information booth, Iwa was a conference sponsor and supplied a 4" by 8" informational flyer (a "rack card") about Iwa that was included in a special "grab bag" given to every participant. The slideshow above is a chronological journey through the conference and will provide a taste of what went on. The captions provide some details that are not mentioned in this article. Please take a look! Click on the "Pause" button on the image, or click directly on the thumbnail, to pause the slideshow. Click on the thumbnail to jump to that image. Put the cursor over/on the thumbnails and move it right or left to go to a particular thumbnail/image of interest. opportunity to re-connect with old friends and ministry acquaintances. Stan and Cyril really enjoyed spending time with Iwa Advisory Board members such as Wayne Ogimachi (Lighthouse Christian Church, Seattle area), Tom Steers (Navigators), and Calvin Yim (Christian Layman Church, SF Bay area), and Iwa Associate Arlene Inouye (ArborSpring). And they were happy to see Iwa Advisory Board Member Barry Deguchi (Catalyst Christian Community) briefly just on Tuesday evening. They were also tremendously blessed by the many divine appointments God gave them with people they met for the first time and others they had known or met before. "The gallery that represents my works, Dillon Gallery, was under 12 ft of water at one point. The water gushed in with such a force that the surge bent one of the steel garters that held up the gallery. The staff, knowing that the storm was coming, prepared by lifting the paintings up on the first floor high above the floor, but the water pushed the supporting structure over, and all the paintings drowned in a mixture of the storm water and oil from a nearby oil heating unit. 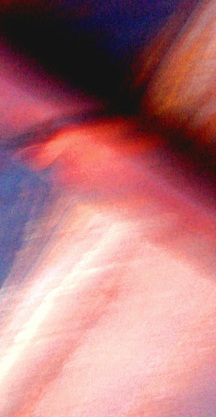 somehow, as the art is feeding us, and my attachment cannot be too deep either. 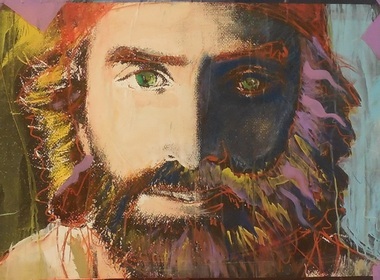 Please take a look at the video about The Four Holy Gospels project posted above. Mako's son, Ty, helped produce it. And why not also take a look here at a slideshow of Mako's Four Holy Gospels Exhibit at Azusa Pacific University last year in November? And while you're at it, you might as well read Cyril's blog about last year's exhibit on Iwa's Facebook page here. And you really must take a look at a preview of the new retrospective documentary on Mako and his art called "Golden Sea" here. If you didn't go to the conference--AAPIs Seeking Biblical Values and Social Justice—sorry, but you missed out! I was on the planning committee for it and it far exceeded my expectations. We had hoped to get 100 participants, and over 170 registered! Jim Wallis of Sojourners was the headliner, but in my opinion, the keynote addresses and the workshops on Saturday stole the show. I felt a lot of buzz and energy throughout the conference. And it was so inspiring to see so many young AAPI Christians participating in something that had real meaning to them. I'm presenting here a slideshow that represents a photo journey through the conference through my eyes. I thought I'd try to give you a flavor of what I experienced through images as well as enough words to clue you in on what you're seeing. Hope you enjoy the journey! I participated in the all-day conference of Reaching Japanese for Christ (RJC) on Saturday, September 29. And I'm so glad I did. The Lord seems to be turning my attention to Japan and Japanese-speaking people lately. And this conference was another good attention-getter. I only registered the week of the conference. No sooner than I did, I got an e-mail from Rick Chuman, JEMS Executive Director, asking me if I'd like to have a display table for Iwa at it. Free publicity? How could I refuse? And soon I was also volunteering to participate in the Open Mic Session for introducing various ministries by sharing a "two-minute" presentation about Iwa. And I was agreeing to be a part of the table networking time at which I, along with other ministry reps at separate tables, would have two 10-minute roundtable discussions with two different groups of participants interested in finding out more about our ministries. Before I knew it, I had become more than just an attendee. I was a ministry rep. I had to thank the Lord for confirming to me through all this that it wasn't just my idea to be there, it was His. Rick was not just one of the organizers, he was also one of the featured speakers. His morning message--God Is On the Move . . . How About You?—helped us see how the dispersion of Japanese throughout the world (the "diaspora") makes it possible for us to reach Japanese people for Christ without having to go to Japan. He shared how personal the reaching of Japanese people is for him, as many of his relatives in Japan don't yet know the Lord. I have a few relatives in Japan myself, but I feel more focused on people living here. So I resonated with Rick's encouragement to reach Japan starting with people from Japan that are right around us. I attended 2 of the 8 seminars offered. From the 4 morning seminars, I chose to attend Paradigms of Nichigo and English Ministries because two pastors from my church, Gardena Valley Baptist (GVBC)--Steve Langley and Eiji Osato—were on the panel, and I was interested in hearing what they had to say. What I learned from the 5 pastors on that panel was that all the churches they represented had at least some joint activities between Japanese- and English- speaking congregations, but the degree to which the congregations regarded themselves and operated as one church differed. I didn't know this before, but my church, GVBC, since 1992, incorporated the Nichigo ministry into the overall budget. So GVBC has seen itself for 20 years as one church with a ministry to Japanese-speaking people, not as two different congregations that make up the church. Pastor Eiji said that it frees him to do new things because he doesn't have to run his ideas through a separate board that would probably be stuck in its traditional way of doing things; he just needs to get an okay from Pastor Steve. And the changes have been dramatic. In one year, the regular worship service attendees went from 45 to over 100. In the afternoon, I chose to go to the seminar that sounded "very Iwa"— Understanding Japanese Culture: Cultural Considerations for Reaching the Japanese. I never heard of Arthur Rouzer, but I was interested in finding out who he was and what he had to say. 5 years of missionary experience in Tokyo. In Part I of his presentation, he showed from Scripture how Apostle Paul and Jesus Christ tailored their messages to their audiences. He contrasted "Paul in Antioch" (Acts 13:14-52) where Paul quoted authoritative sources to the Jews he spoke to, with "Paul in Athens" (Acts 17:15-34) where Paul used poetry and philosophy to teach the Greeks and other non-Jews. He explained how Jesus used carefully chosen "I am" statements (I am the Living Water, the Resurrection and the Life, the True Vine, etc.) to connect with the people he talked with. So like Paul and Jesus, when we witness to people, like the Japanese, we need to make sure that the Good News we share sounds like good news to them. He then proceeded to explain the contrast between "we" and "I" cultures (group-oriented—Japanese, vs. individualistic— American); the distinction between "high context" (e.g., indirect and ambiguous—Japanese) and "low context" (e.g., direct and explicit—American) cultures; and the difference between shame (I did something wrong—Japanese) vs. guilt (I did something wrong—American) cultures. Based on these things, he pointed out that group involvement is important for evangelism to "we"-oriented Japanese, noted that "good theology" is lived theology (lives speak more than words) to the high context Japanese, and explained that because love gets rid of shame (while paying a penalty erases guilt) Christ's love might be the Good News that shame-oriented Japanese can connect with. It was so refreshing and impressive to hear a younger generation person sharing cultural insights about evangelism to people of Japanese ancestry that were right in line with what Iwa's been talking about for over 30 years. So at the end of the conference, I made a beeline to Arthur and spent significant time talking with him about our shared passion—contextualization of the gospel and ministry for people of Japanese and Asian ancestry. I gave him some of Iwa's booklets, and he'll be sharing with me some things he's written. I'm looking forward to seeing what the Lord wants to do with this divine appointment He gave us. The conference closed with rousing worship and a powerful message. The speaker, Eiji Osato, shared his own experiences at GVBC over the past year that resulted in the Nichigo congregation growing to over double the size. And he challenged us to believe, pray, and obey, as he did, so that we can see many Japanese people reached for Christ in Southern California. I felt the passion and dedication of a whole room full of people with one mind and one heart for reaching an unreached but not unreachable people. I left inspired and hopeful, expecting that the Lord will do great things as a result of our being together. Cyril Nishimoto, Iwa’s Executive Director, and Mark Tajima, a close friend and Iwa supporter from the church we both belong to, were on the planning committee of the conference entitled Asian Americans and Pacific Islanders Seeking Biblical Values and Social Justice held at Union Church this past Friday evening and all-day Saturday, October 12-13, 2012. I struggled to say “yes” and pay the registration fee to attend because of all the stuff left undone on my “honey-do” list at home. But, how could I say no? Cyril and Mark, along with all the rest on the conference planning committee, had selflessly invested over a year of their equally busy lives helping to make this ground-breaking, history-making conference become a reality. So, I went. And, was I glad I did. This short article is not about the conference itself, even though I could share a lot about what was so great about the conference. But, what I want to do is introduce you to one of the people I met that really renewed my hope in the future. He is just one of the many seriously committed and gifted young Christian Asian Americans who were there seeking to fulfill their Lord’s work in the world. All I met were dead serious about wanting to authentically and courageously allow God to confront head-on the oppression and suffering rampant around the world resulting from the lack of social justice. The guy I want you to meet is Jason Chu. Jason is a 26 year-old self-described “pastor who raps.” He is known as the Grand Master. Thus, his internet location is www. grandmasterchu. com. I will let him share for himself online the specifics of his life. As for me, the best way for you to get a peak into why I am so impressed with how creatively God is shaping the future through people like Jason is by linking you to several of his YouTube videos. The first is an animated kinetic typography video called My God. The second is Jason rapping about his own spiritual journey called The Uncool. And the third is an animated music video entitled ChristianMuslim. At my age, I’m not someone who grew up with rap music. I normally don’t “dig” it. But, I am definitely “hip” to Jason’s “groove.” I think you will be too. In any case, you will definitely realize why I see him as epitomizing that place "where faith, art and culture meet”—where Iwa lives. On September 19, Stan and I had the tremendous privilege of getting more exposure to what God is doing in Japan through people who have ministered to survivors of the 3/11 tsunami disaster in Ishinomaki City. Our friend, Naomi Hirahara, award-winning author of the Mas Arai mysteries, spent two weeks in July with a team of 12 participating in the relief efforts spear-headed by Grace Mission Tohoku (GMT). GMT is a combined ministry of Help Tohoku (Oyumino Church in Chiba) and Grace City Relief (Grace City Church Tokyo). Their aim is to build community, rebuild homes, and create jobs in the Tohoku area. Naomi introduced us to Virginia Lavallee, GMT's Community Development Volunteer Coordinator/Logistics, who was in the U.S. taking a break from her work and raising support for GMT. Virginia wanted to meet people from Japanese American churches, so Naomi brought her to First Presbyterian Church, Altadena, to meet with Pastor Mark Buchanan and a few others, as well as Stan and me. I was very impressed with the work being done there. It seems that if anyone has a particular talent he or she wants to offer—basketball playing, cooking, hula, music—GMT will find a way for the person to use it in an outreach project GMT or the person designs. Visitations to survivors in their homes are very much appreciated as the people want to share their stories with compassionate, listening ears. And when they see Christians from all over the world coming to help them, they can't help but have a positive view of Christianity. People's hearts have been gradually turning to Christ. Stan and I find that GMT's approach exemplifies Iwa's "Witness Through 'Withness'" philosophy of relational evangelism (see the article on the right). easily make little cakes for omiyage that they can take with them when they visit people. The video GMT produced above is very powerful. I think that the real impact of the ministry can be felt through the lives of the people who have been touched by GMT's ministry, and GMT sensitively captured that impact in this video. I hope you will enjoy it as much as I did. GMT welcomes volunteers, especially those who can stay for a week or more. For more information, go to GMT's website here. And please feel free to contact Virginia at Virginia.lavallee@gmail.com. As a UCLA student last year, Jenni Nakamura, made the film, The Heart of a Caring Cook, for an Asian American Studies class entitled, "Ethnocommunications: Creating Community Media." Spanning three quarters, the class taught the basics of camera operation, editing, and storyline to produce films in communities that are underrepresented in mainstream media. Jenni created the film not only to fulfill a short film assignment, but also to share a testimony of God's faithfulness and love toward an individual—her Sansei grandmother, Betty Mikuni--who helped to love and serve a community. As a member of First Presbyterian Church, Altadena, Betty started the Caring Cooks ministry as a way of demonstrating Christ's love and care for Nisei seniors and others in need in her church, as well as others in the community outside of the church, through the making and delivering of freshly-prepared meals once a month by a group of dedicated volunteers. By capturing this story on film, Jenni preserved a bit of family history, created a moving tribute to her grandmother, and honored the legacy of faith in Christ and of love and service to people, and the community, that was passed down to her. But Jenni also saw a bigger picture. According to her, "This is not just a story about a church or just a ministry, but rather, it is a greater story of the Body of Christ loving the Lord and loving others through food." An aspiring filmmaker finishing up an Asian American Studies BA at UCLA, Jenni hopes to use creative works to inspire others to grow and take action in faith, and to embrace and serve the ultimate creative Creator. May the story Jenni so expertly and sensitively tells give you a fresh experience of Christ and his love and care for people and for a community, and draw you closer to him. It is a tremendous honor and privilege for us at Iwa to present The Heart of a Caring Cook to the world here on our website. The film is right at that place where faith, art, and culture meet—right in line with the ministry of Iwa. The voice heard at the beginning of the film happens to be the voice of Iwa President, Stan Inouye. Also seen and heard in the film is Iwa Associate, Pete Morris (see "The Metro Da Vinci" here). Both—showing their Iwa colors—provide cultural insights that greatly enhance the understanding and appreciation of the Caring Cooks ministry. We are so grateful that with this film, we can showcase the enormous talent of an up-and-coming younger generation person such as that of Jenni Nakamura. We're praying that Jenni's work will inspire others, especially younger generation people, to use their God-given talents in similar ways. Let us know what you think. Please go to the bottom of this page, to the Feedback Corner, fill out the form, and share your thoughts with us. Iwa turned 30 years old in September 2011. It's an amazing milestone. God has been so faithful all these years! To commemorate significant anniversaries like this, in the past we have held banquet celebrations. We've held off on this one because we wanted to see what the response is to things that are in process, such as our new website and our new God Man resources, so that we will have some concrete things that we can share with everyone, and truly celebrate. We haven't ruled out having a formal celebration. Like Disneyland and its 50th anniversary, we can extend our 30th anniversary over a whole year or more. In the meantime, please pray that the Lord will continue to bless Iwa's ministry and give us much to honor and thank him for. And why not read about our 30-year history (click here) and view some highlights from the past (click here)? You might be interested in seeing some old pictures like the one of the staff in 1982 shown above.